Peerless has packaged flexibility and ease together in one box with these ceiling/wall mounting kits, which enable the installation of a projector from either the ceiling or the wall. This all-in-one kit includes the industry’s first precision gear projector mount that delivers precision image alignment with a simple turn of a knob. 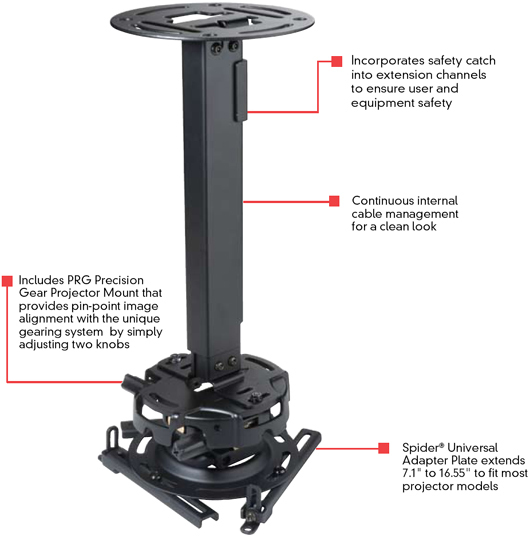 These comprehensive projector mounting kits also include an adjustable length column that provides ideal height positioning for the perfect projector installation. Concealed within the column is a cable-management channel, assuring a clean and clutter-free appearance. 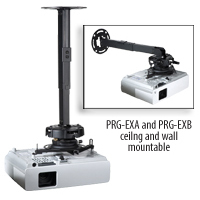 This kit combines the precision adjustment capabilities of the PRG projector mount line with a convenient variable-adjustable square column extension kit. 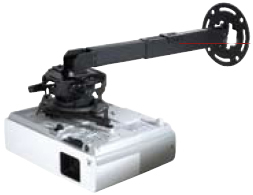 Each kit includes the ceiling/mount, extension column and mounting hardware for either ceiling or wall applications. You also get color-coordinated wire slot covers for neat and clean installations. PRG-EXA(-S)(-W): 6.5" - 16.55" x 8.7" - 12.8" x 6.5" - 16.55"